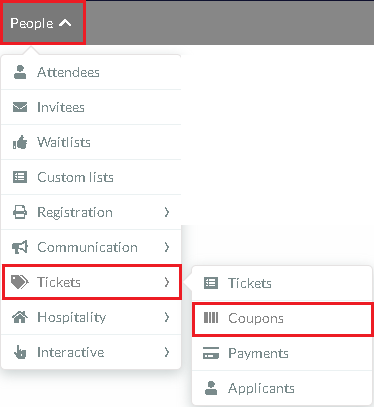 How do i delete event discount coupons? Press the ' + ADD COUPON' button in the top left corner. When complete, press the blue 'CREATE' button. You can also extract a spreadsheet with a report of all registered discount coupons to see which coupons have already been used. To do this simply click the 'EDIT' button in the top right corner. Then the 'REPORT' button will appear in the top left corner . Press 'REPORT' and You will receive the spreadsheet by email. To delete a coupon, click the 'EDIT' button in the top right corner, select a coupon and press the orange 'X' button on the far right side. A warning box will appear asking 'Are you sure you want to remove the entire selection? ', Press the red 'REMOVE' button. Press 'END' in the top right corner to finish.